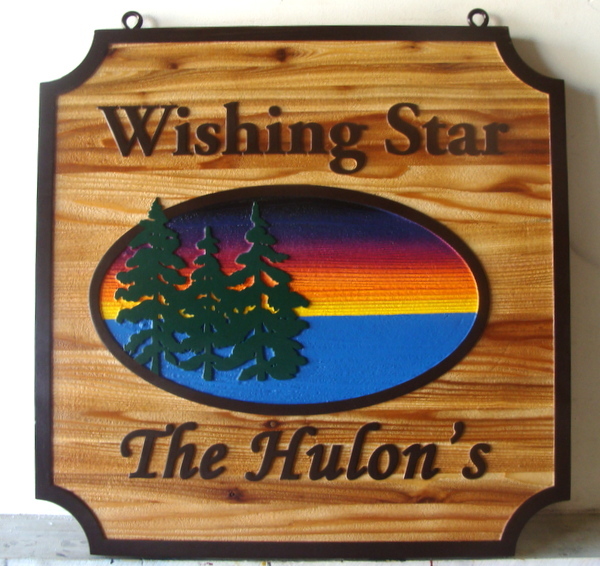 Shown above is a carved and sandblasted Cedar wood property sign for a lakefront cabin "Wishing Star". This cedar sign's background is first carved out with a router (incised), with the outlined text, border and center scene raised. The sign's background is then lightly stained and the text, border and art are hand-painted. An airbrush is used to paint the sky during sunset. Two layers of clear-coat are applied to protect the sign against scratches, rain, snow, and UV fading. This sign can be mounted on a door, an adjacent wall, a gate, on a metal or wood post, or hung from a wood or iron hanger.